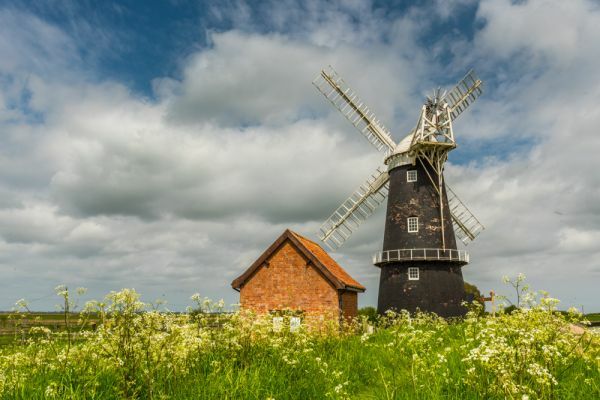 Berney Arms Windmill is a restored mill, originally used to grind material used in the making of cement. The mill was later converted to use for draining the surrounding fens. 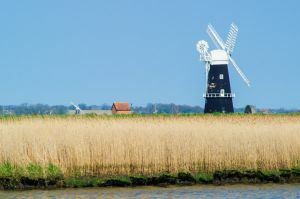 The mill stands on the north bank of the River Yare 4 miles south-west of Great Yarmouth. 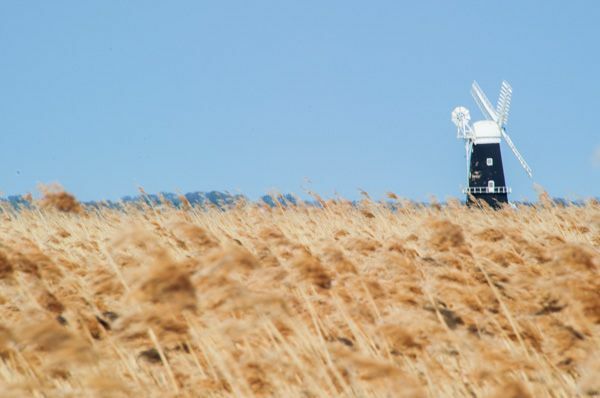 The 7-storey mill stands 71 feet high, making it the tallest drainage mill in Norfolk. Its tapering exterior is coated with tar, giving it a striking dark black look. There are 4 sails and a fantail, driving a scoop wheel unusually situated well away from the mill itself, driven by a horizontal shaft. The mill was begun in 1865 for the Reedham Cement Company on the site of an earlier mill. It was used to grind cement clinker, a mix of chalk and clay. The mixture was fired at kilns a short distance away, then ground in the mill to create a fine powder. At its height, the cement works supported a small community of 11 houses and a chapel. Cement production only lasted for 15 years, closing in 1880. 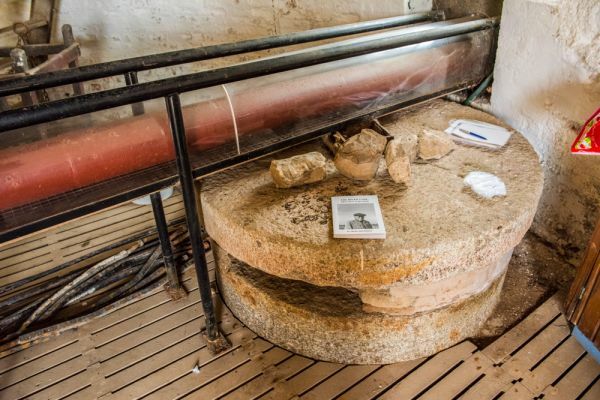 Three years later in 1883, the mill was converted to drain the surrounding marshland, with a gearing mechanism connected to a drainage scoop outside the mill building. In 1943 the mill was closed for the second time and drainage was run off motor pumps. 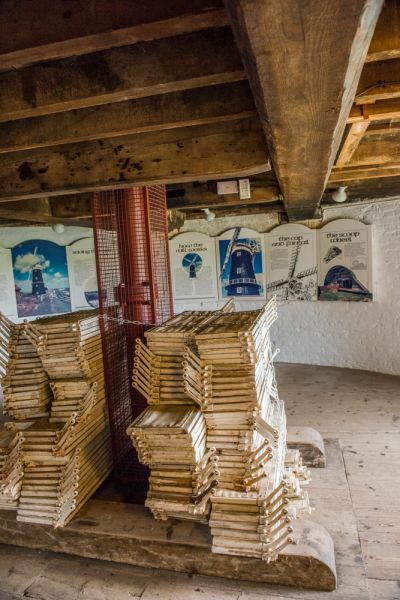 In theory, the mill is only open by pre-booked group tours through English Heritage. 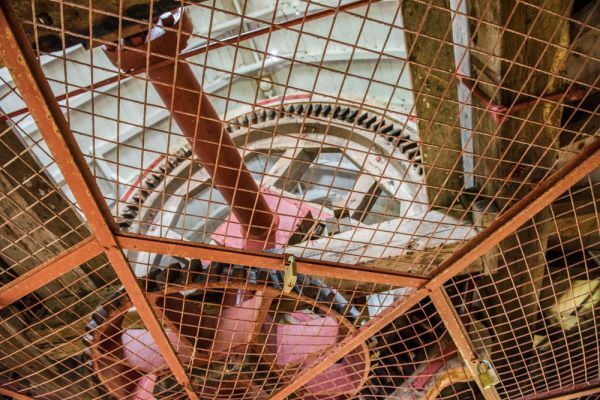 I say 'in theory' because I visited without pre-booking, during Mill Open Days, when volunteers at historic mills around the county open mills to the public. There were several volunteers on hand to answer questions about the mill, its history and operation, and an RSPB representative to talk about the ecology of the area, which is a haven for wildlife and insects. Even if you don't manage to visit during an open day, you can still enjoy the mill and its beautiful setting. The easiest way to visit is by water, for there are free mooring places along the river outside the mill and the nearby riverside pub. If you don't have a boat, or simply want to enjoy a lovely walk, you can easily reach Berney arms Mill on foot from Wickhampton. The official English Heritage directions suggest walking from Halvergate, but I think the route from Wickhampton is (marginally) shorter. There is a parking area beside the church at Wickhampton, and a level trail leads across the marshes. The trail is paved at first, but the paving ends after a mile or so. You can see the mill in the distance. I highly recommend an OS map, as you can also see Polkey's Mill, further to the southwest. I made the mistake of heading for Polkey's Mill, thinking I was heading straight for Berney Arms. By the time I realised my mistake I had turned a 5-mile stroll into an 8-mile hike. If you don't repeat my mistake you will soon join the Weaver's Way trail, which leads across farm fields, over the railroad track, to the mill. Ah yes, the railroad. 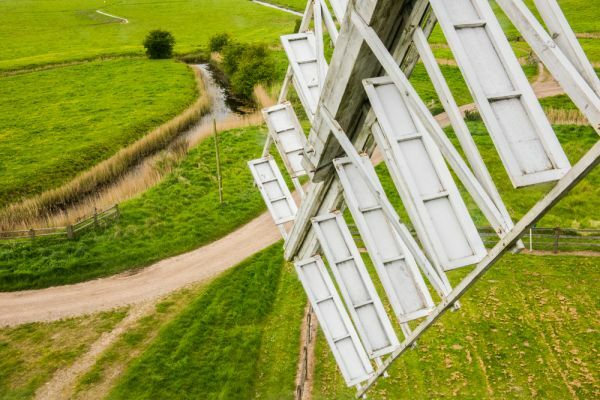 There is a third way to reach the mill, and that's to take the trail from Great Yarmouth in the direction of Reedham and get off at Berney Arms station, a request stop in the middle of Berney Marshes. From the station it is an easy quarter mile stroll to the mill. The only trouble is that rail service can be infrequent, so make sure you have studied the schedule before setting out! 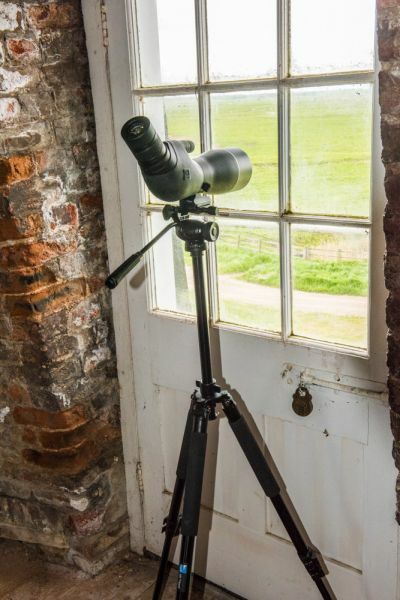 Location: On the north bank of the River Yare, accessible by boat from Haven Bridge or on foot via a footpath from Halvergate or Wickhampton, a distance of 3.5 miles.